A recent Guardian survey identified Great Expectations as the nation’s favourite Charles Dickens tale, and, with two movies, a BBC mini-series and a Charlotte Rampling-starring tv film all having been released in the last 15 years, there’s no denying Great Expectations pull. It’s Charles Dickens’ Pride and Prejudice. The latest take on this enduring classic is Jo Clifford’s adaptation for the stage whose 1998 script was updated by director Graham McLaren for Dickens’ bicentenary last year and now makes its London debut at the Vaudeville Theatre. So what is it about Great Expectations that catches people’s imagination more than any of Dickens’ other works? I suspect that the allure lies with the doomed romanticism of the cobweb-covered Miss Havisham, perhaps Dickens’ most beguiling character. This production certainly seems to think the jilted old lady lies at the heart of our fascination with the story, setting the entire play in Satis House as an older omnipresent Pip (Paul Nivison) watches over the ghosts of his past. Condensing a novel as complex and long as Great Expectations meant extracting the essence, dispensing with the subtitles and trimming the characters down to their bare bones, which this production did with mixed results. The wonderfully daft Herbert Pocket becomes a small, if rather amusing, turn on a mantlepiece while the dastardly Bentley Drummond gets consigned to fondling Estella over a table for five minutes. The other minor characters fare better in most cases, Chris Ellison’s menacing Magwitch was a particular standout while Jack Ellis as Jaggers walked just the right line between caricature and characterful. 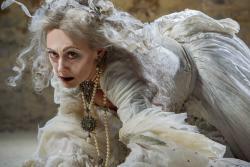 Paula Wilcox’s Miss Havisham (pictured) was as bitter and desperate as we’ve come to expect, but was rather underused. The set is the show’s trump card, a magnificent, dusty creation with all the cobwebs and moudy wedding cake of our imaginations vividly brought to life. The atmosphere is gloomy and sinister although the gothic feel is more Camden Market than Victorian, not helped by the ‘ghosts’ wearing black nail varnish and a young Pip (Taylor Jay-Davies) resemblance to Placebo frontman Brian Molko. As visually delightfully as this production was it felt, ultimately, as cold as Estella’s heart. The very stagey, ‘am-dramminess’ of it that made it a theatrical spectacle stripped the story of its sincerity and warmth. The emotion seemed forced – there was a lot of moments when the actors strained to bring tears to their eyes when a more subtle and less desperate direction would have been more moving. And what was with the constant use of the characters’ names (“I know Joe”, “yes, Pip”, “It’s not right, Joe”)? The affection came across like a nervous tick. A fun, frivolous piece of theatre that is absorbing if ultimately rather unfulfilling. This entry was tagged Charles Dickens, Chris Ellison, Great Expectations, Jack Ellils, Jo Clifford, Miss Havisham, Paul Nivison, Paula Wilcox, play, Review, Taylor Jay-Davies, theatre review, Vaudeville Theatre. Bookmark the permalink.